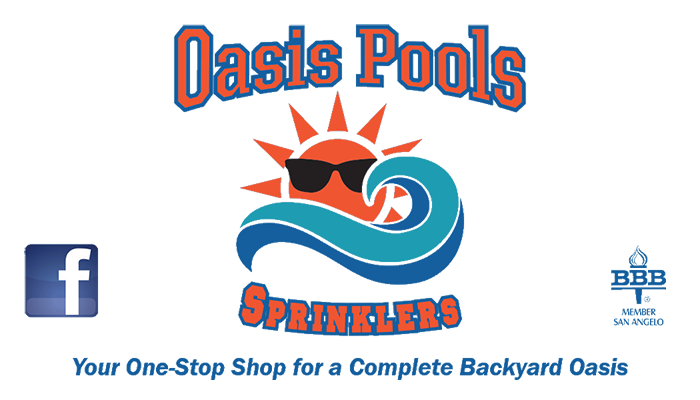 Oasis Pools and Sprinklers is a locally owned and operated landscaping business. We provide commercial and residential landscaping and irrigation services to San Angelo, TX residents. Our owner received his irrigation license before starting this company more than a decade ago. The Oasis team loves nothing more than providing outstanding customer service. Each member is prepared to handle any irrigation or landscape project you have. Contact our office in San Angelo, TX today to learn more about our commercial and residential landscaping service. After you call us, we'll meet with you to discuss your project in-depth and bid on it. Once we understand exactly what you're looking for, we'll get started as soon as you give us the go-ahead. Our team will work tirelessly to complete your project according to your specifications. Call us today to learn how your San Angelo, TX property can benefit from our irrigation and landscaping services. Oasis Pools and Sprinklers values quality and customer service above all else. When you choose us, you'll work with a team of experienced professionals who will complete your job correctly the first time. If we're experiencing a high volume of customers, we'll get to your project as soon as we can. We'll communicate with you every step of the way to make sure you're satisfied with our work. Call 325-895-0564 today for a free estimate on your landscaping project in San Angelo, TX. Copyright © 2019 Oasis Pools and Sprinklers, all rights reserved.